Whether it's just a simple stand-alone slide or merry-go-round, Noah's pARK & Playgrounds™ can provide a full installation crew, or simply do a drop-ship if that's your preference. We have a full installation crews; Supervised Installers for a less-expensive install option (using your crew of volunteers & equipment); a community install (using NPP supervisor, equipment but your volunteers), or do a direct delivery for you to conduct your own installation. 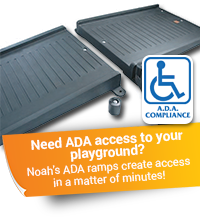 Whatever your needs, Noah's Park and Playgrounds can handle all types of installation requests. Noah's Park and Playgrounds wants to make purchasing products as easy as possible. We know many clients rely on purchasing cooperatives such as BuyBoard, TIPS-TAPS, Public Purchase, as well as their own regional or local purchasing cooperatives. Noah's Park and Playgrounds is a member of numerous cooperatives, as well as being a registered vendor with thousands of county, city and state purchasing offices. If you need assistance with a bid or a quote for an RFP, RFQ, call our corporate office on our Toll Free number 877-248-5444. We will be glad to help find a way to transact the purchase through one of many purchasing cooperatives in your area. Tax Benefits - You can deduct your monthly payment as an operating expense. Financing your park or playground equipment also helps you avoid the Alternative Minimum Tax by reducing you AMT liability. Flexibility - Minimal down payment. You can structure payments to fit your budget. Noah's will work with your design team, architect, or landscape architect to create the ideal park or playground. Historically, we try to help our clients understand all the factors which could potentially go into building their ideal parks or playgrounds. When clients recognizes how a new playground or park area is going to impact their surrounding landscape, they begin to realize just how much more thought and pre-planning needs must take place. Clients come to us with every type of budget and we always want to help get the maximum value out of every dollar. If you need items to assist in your fund-raising efforts, we can provide color posters or small flyers to help get the word out to your donor community. If you need 2-D or 3D posters detailing your site with proposed equipment, we can help. This tool will help your fund-raising efforts tremendously. Noah's pARK & Playgrounds™ strives to represent the highest quality manufacturers in the park and playground industry. We are confident in our manufacturers and will uphold all manufacturer warranties. Noah's pARK and Playgrounds also offers a one-year limited warranty on all labor with installation.